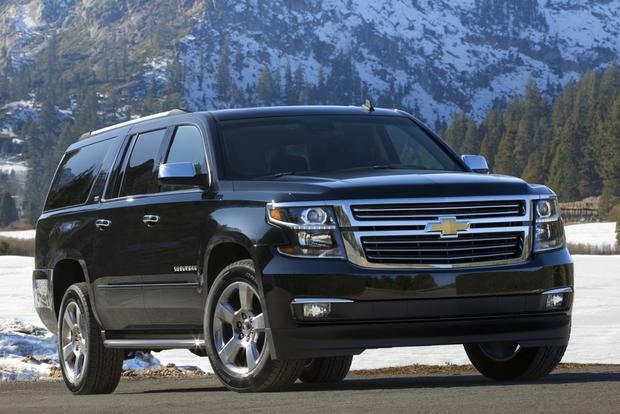 The 2016 Chevrolet Suburban may have been recently redesigned, but it still has all the old, familiar features Americans have come to expect from the country's longest-running full-size SUV. Chevrolet knows there are plenty of competitors for its family hauler, especially from the likes of the new Ford Expedition EL and Toyota Sequoia, so the company upped the ante last year, giving the Suburban more features, more luxury, more power and better fuel efficiency. Regrettably, some of the more antiquated features from the previous model haven't been addressed, namely the inability of the third-row seats to fold flush into the floor and a low tow rating. There's so much more to like about the new Suburban that we're willing to overlook some minor missteps, and we think the public will, too. 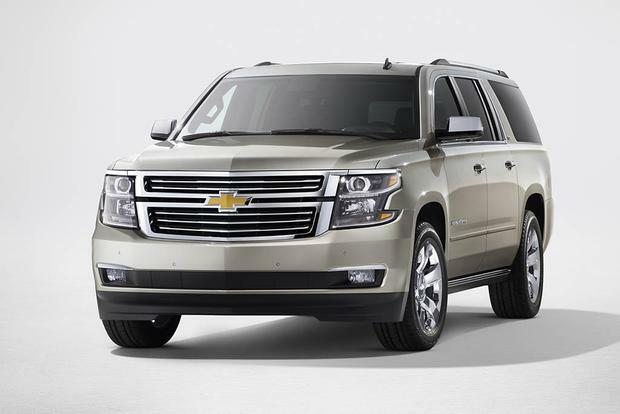 For sheer passenger space, it's hard to surpass what the Suburban offers. 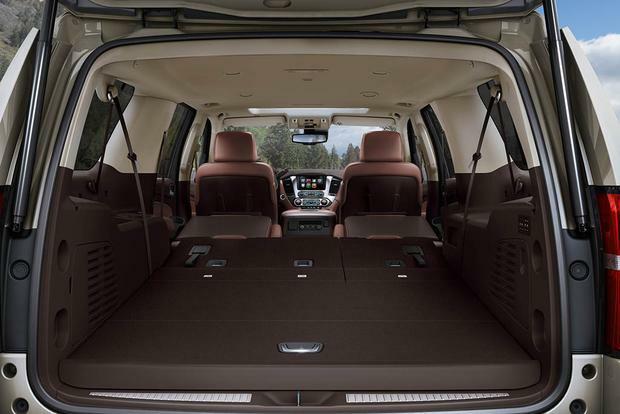 When equipped with the available front bench seat (a rarity these days) the Suburban can hold up to nine people, and unlike many shorter full-size SUVs, the massive Suburban has plenty of room behind its third-row seat for storing luggage or the family pooch. The newest Suburban is also more luxurious than previous models, which strengthens its appeal to style-conscious consumers, but also elevates its price tag to levels many families may find out of reach. 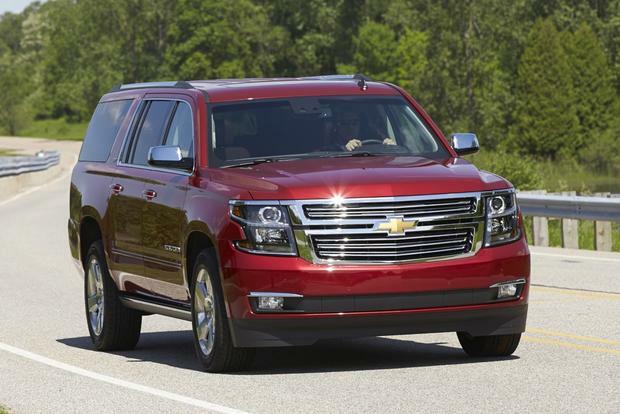 Despite major updates last year, the Suburban makes a few important changes for 2016. This includes a newly available reconfigurable gauge cluster, a heads-up display and a new lane-keep assist feature. The SUV adds some new colors and loses its standard CD player. 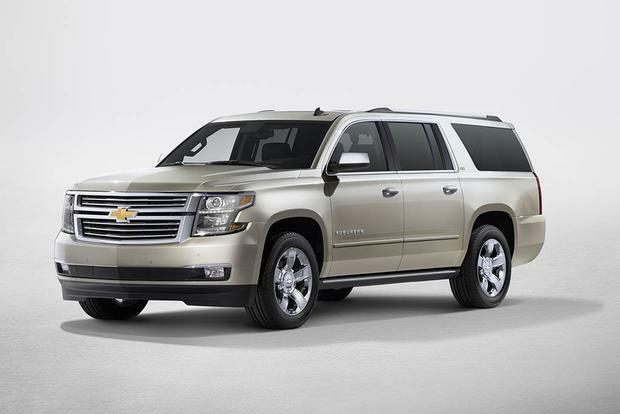 The Suburban's only engine choice is a 5.3-liter V8, good for 355 horsepower and 383 lb-ft of torque. Coupled to a 6-speed automatic transmission, this engine achieves 16 miles per gallon in the city and 23 mpg on the highway. Opt for the 4-wheel-drive option (4WD) and the mileage drops slightly to 15 mpg city/22 mpg hwy. The 2016 Chevrolet Suburban comes in three trims: LS, LT and LTZ. The Suburban LS ($50,900 for 2-wheel drive (2WD) and $53,900 for 4WD) includes a 5.3-liter V8 engine, a 6-speed automatic transmission, a heavy-duty locking rear differential, a trailer hitch and 7-wire harness, rear park assist, OnStar, a 6-speaker AM/FM stereo with HD and SiriusXM radio, side assist steps, heated outside mirrors, 18-inch alloy wheels, a rear-vision camera, a remote starter, Bluetooth hands-free cell phone connectivity, tri-zone automatic climate control, a 110-volt outlet, front bucket seats that can be substituted for a 40/20/40-split bench seat at no extra cost, a 10-way power driver's seat, a power passenger seat with power lumbar and recline, steering-wheel-mounted audio and cruise controls, a tilt steering wheel, 2-year/24,000-mile free scheduled maintenance, a 3-year/36,000-mile bumper-to-bumper warranty and a 5-year/100,000-mile powertrain warranty. 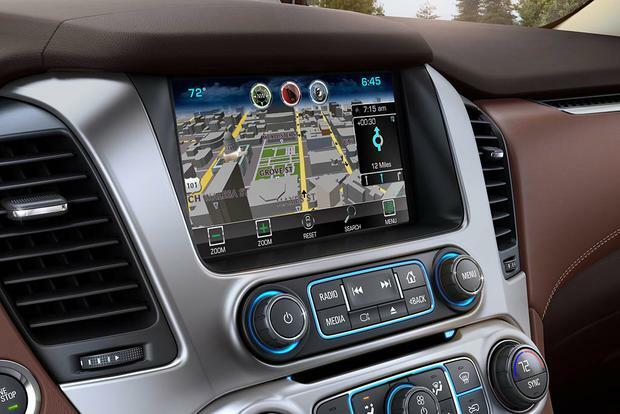 The Suburban LT ($55,300 for 2WD and $58,300 for 4WD) adds forward-collision alert, a power rear liftgate, MyLink infotainment with an 8-in color touchscreen and five USB ports, Bose premium audio with nine speakers, leather seating, heated front seats, a tilt-telescopic steering wheel, lane-keep assist and power adjustable pedals with memory for the driver's seat and pedal placement. 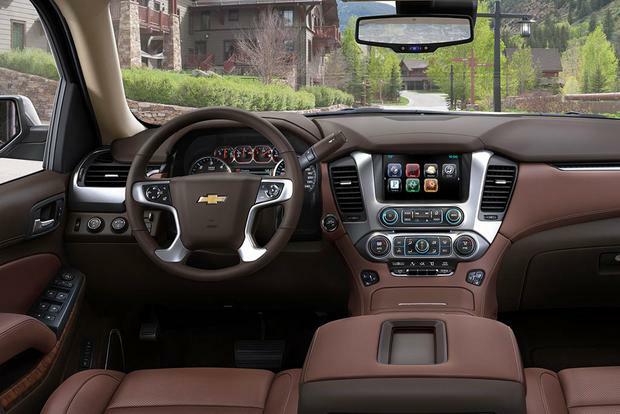 The Suburban LTZ ($65,500 for 2WD and $68,500 for 4WD) adds magnetic ride control, keyless entry and access with push-button starting, front and rear park assist, power-folding outside mirrors with memory function, 20-in polished aluminum wheels, HID headlights, fog lights, a Bose Centerpoint surround sound 10-speaker audio system, heated and cooled front seats, heated second-row seats, power-release second-row seats, power-folding third-row seats, a power tilt-telescopic and heated steering wheel, rear cross-traffic alert and side blind spot monitoring with lane-change alert. Option packages for the LS include the Driver Alert package (forward-collision warning, lane-keep assist, a safety-alert seat warning system and power adjustable pedals), the Max Trailer package (a 3.42 rear axle, a rear air leveler and trailer brake control, and on 4WD models, a 2-speed active transfer case), 20-in wheels and a dealer-installed rear-seat entertainment system. The LT can be equipped with many of the LTZ's standard equipment when ordered with the Luxury package (blind spot monitoring system, keyless entry and push-button starting, a power-folding third-row seat, power-folding outside mirrors, heated second-row seats, a heated steering wheel and a power tilt-telescopic steering column). The Sun, Entertainment and Destination package adds a power glass moonroof, a navigation system and a rear-seat DVD entertainment system. These items can also be ordered individually. The LTZ offers only a few options, including a power glass moonroof, a navigation system, a rear-seat DVD entertainment system, power retractable side steps and adaptive cruise control. 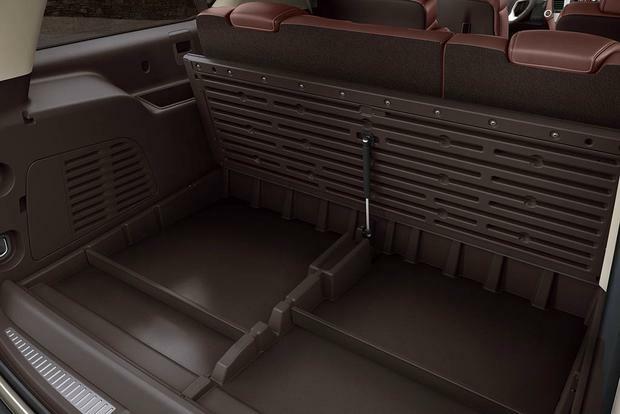 The Suburban carries a full complement of airbags, including front-seat, side-impact and full-length side-curtain airbags. Also standard is the segment's only front-seat center-mounted airbag (for models with bucket seats only), which provides greater protection to the driver and passenger in the event of a side-impact collision. Additional safety equipment includes available lane-keep assist, rear cross-traffic alert, a blind spot monitor and a radar-based forward-collision warning system. In crash testing carried out by the federal government's National Highway Traffic Safety Administration, the 2016 Chevrolet Suburban earned four stars out of a possible five. The Suburban hasn't yet been tested by the nonprofit Insurance Institute for Highway Safety. You already know the Suburban doesn't perform like a low-slung sport sedan. Just like a good 300-lb NFL linebacker, the Suburban will surprise you with its speed, its athleticism and its sheer will to get the job done. On narrow roads, the Suburban requires a vigilant hand at the wheel, but when the road starts to twist and turn, the Suburban proves easy to keep inside the lines. The steering responds precisely to inputs, and the gas pedal requires only the lightest touch to increase velocity. GM's StabiliTrak stability control does an excellent job of keeping the Suburban's 5,500-lb bulk in check, especially during emergency avoidance maneuvers. Inside, we found the Suburban's interior remarkably well-insulated from the outside world, and every comfort afforded by our LTZ trim was appreciated without exception. From its marvelous seats to the upscale look and feel emanating from the dash and door panels, the Suburban feels more like a prestige luxury car than a family transport vehicle. The MyLink infotainment system is especially nice with a large, vivid color screen populated by easily understood touchscreen icons. The voice-recognition software could use a bit more schooling. As for power, the big 5.3-liter V8 has plenty to spare and is easily capable of surpassing the 20 mpg mark when driven at reasonable highway speeds. Those needing to tow should be satisfied with the Suburban's 8,500-lb max limit, although it should be noted that both the Ford Expedition EL and the Nissan Armada have higher tow ratings -- 9,200 and 9,000 pounds, respectively. 2015 Nissan Armada -- The Armada costs significantly less than the Suburban and can tow more weight behind it, but its mileage is nowhere near as good, nor is its cargo space behind the third-row seat. 2016 GMC Yukon XL -- The Suburban's slightly upscale twin, the Yukon XL provides the same dimensions with the option of a larger, more powerful 6.2-liter V8 on the Denali trim. 2016 Ford Expedition EL -- Ford's full-size SUV is every bit the Suburban's equal when it comes to interior space, and its third-row seats fold flush into the floor. The Expedition also has a more powerful twin turbocharged V6 engine and is tow-rated at 9,200 pounds. Used Cadillac Escalade -- If you like the Suburban's size and might but want more luxury, you may want to consider its upscale Escalade mechanical twin. It offers more equipment, bolder styling and a stronger brand name. Prices are steep, though, so you may want to consider a used model. The best value for your money is the LT trim. It costs about $5,000 more than the base LS, but it has more features, plus a doorway to a more robust option list. The LTZ's magnetic ride control feature is its only real advantage over the LT, but we think most people will find that the LT's standard suspension works fine.